Hi there! Today I wanted to share a new blush & lip combo I rocked yesterday. I usually don’t fuss with much makeup on a daily basis, so I guess that’s why it got so much attention. Many people complimented me on it. Tell me what you think! 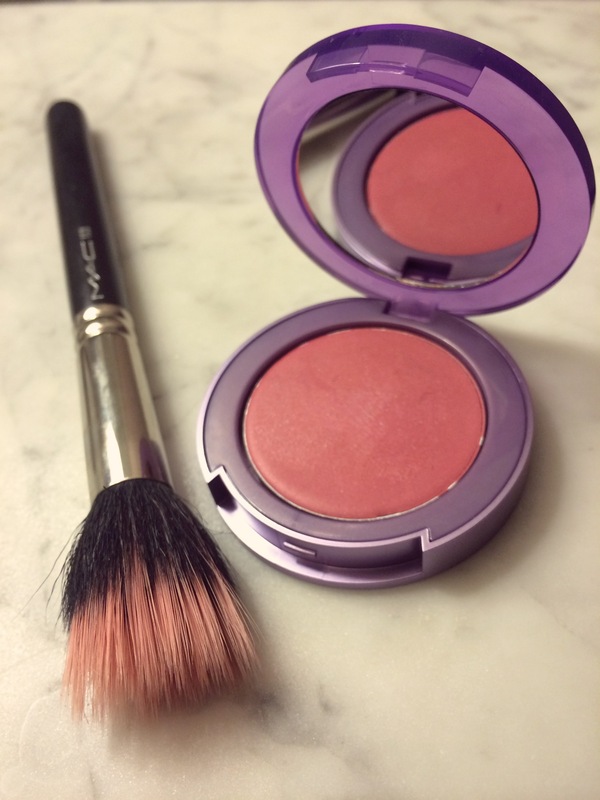 With temperatures getting lower by the day, it was time for me to switch to a cream blush. Of course I went for Urban Decay‘s After Glow Glide-On Cheek tint. 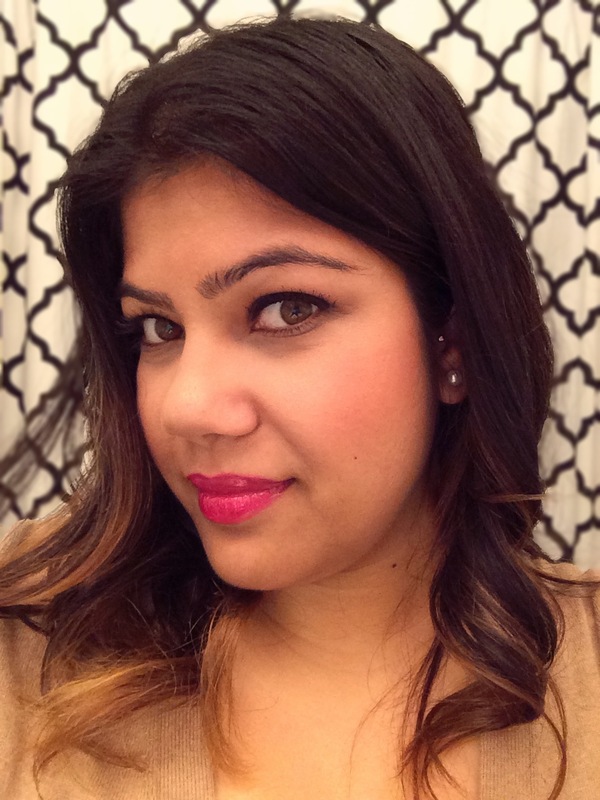 (What a mouthful that is) I love how buildable the color is, and its easy to apply gel-like formula. I love it so much, that I finished my last one literally down to the pan – there was nothing left! That was in the shade Bang, a bright orang-ish red, but for this season I wanted a more muted blush. Applied with my trusty MAC 188 brush, getting the perfect flush was a breeze. I know, I know – $35 for a brush may sound steep. But this smaller cousin of the 188 duo fiber ‘skunk’ brush is a must have for anyone who uses cream blush. Seriously, you buy this once, and you will never ever EVER again use a different brush for applying cream blush. Your makeup application can only be as good as your tools, and I speak from experience that this is THE BEST tool out there. Tap it in the pan, then apply in a circular motion on your cheeks. It yields a wispy, airy application – making building up the right amount of color effortless. 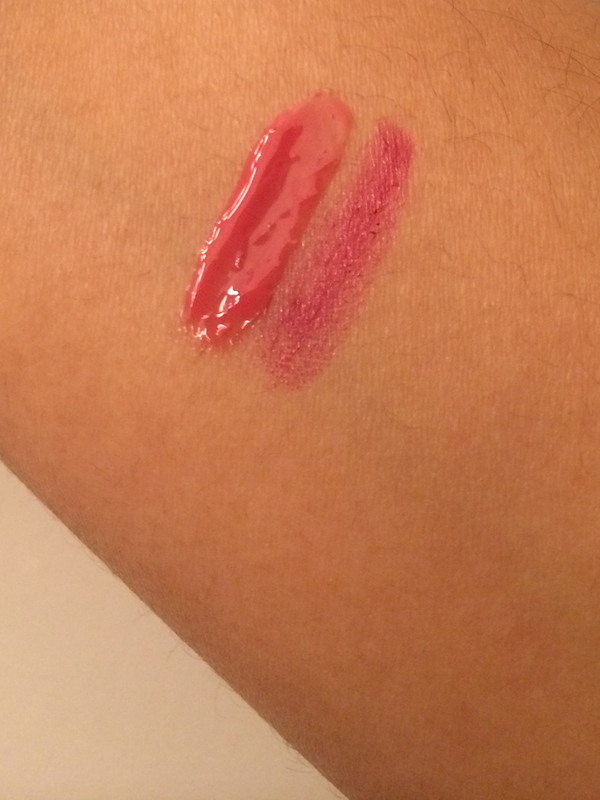 I picked up a great lip & cheek stain from Stila in the color Acai Crush. It is a deep purplish-red sort of color, and what I love about stains like this is how build able they are, giving you the flexibility to get a range of shades out of it. At $24, this will last you a long long time, because for day wear, one click is more than enough! It dispenses a perfect smaller-than-pea sized amount of a reddish gel to give me the color I wanted. It was absorbed by my lips and dried down to no texture at all within a minute. I applied it on my lip to have an anchor of color that would last all day. Then, I applied Lip Fusion’s gloss in Full Frontal on top. 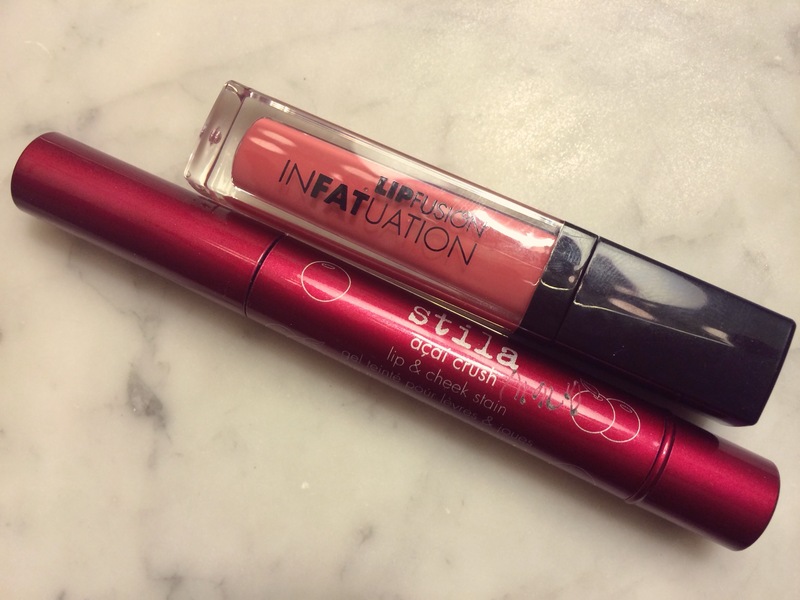 At $29, I really don’t know how much it actually plumps my lips, but I LOVE the citrusy scent of the gloss. With its beautiful soft pink color added on top of the stain, it softened the purplish tone to a more wearable one that was perfect for the office. I’m a big fan of its small brush applicator (not a doe-footed one) – it makes application really precise and just feels nicer! Swatched side by side, I love how these colors layered on top made a berry tone that was just perfect for me. 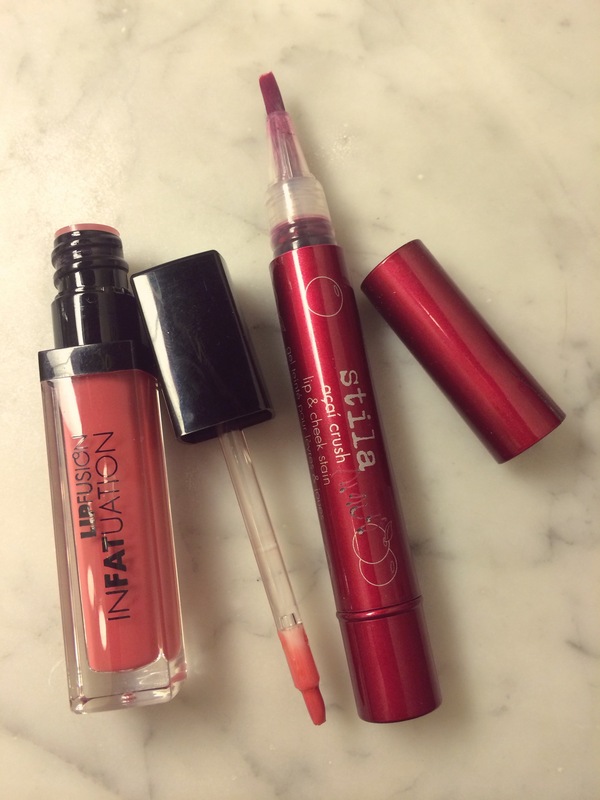 Do you ever layer your lip products? I love the variety of colors you can create just by layering different pencils, lipsticks and glosses with eachother. If you have any favorite combos, I’d love to know! Tags: cheeks, FOTD, Lip Fusion, lips, MAC, stila, urban decay. Bookmark the permalink.